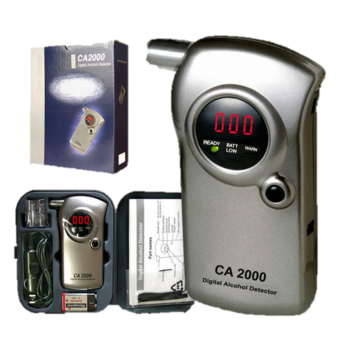 CA2000 Alcohol Breath Test is a unique and highly sophisticated alcohol breathalyzer utilizing the variation of electrical property value of a finely tuned oxide-semiconductor. This Alcohol Breathalyzer will selectively analyze the alcohol concentration in units of ppm in human breath. CA2000 is very accurate and can be used as an aid to prevent drink driving, an on-site alcohol test for employees, an alcohol test for patients, an on-site incident test or a personal test for impairment.